Leaders from the BIMSTEC member states are going to assemble in Kathmandu to participate in the fourth summit of the ‘Bay of Bengal Initiative for Multi-Sectoral Technical and Economic Cooperation’ (BIMSTEC) scheduled for coming Thursday and Friday. Before talking the upcoming BIMSTEC summit, it is contextual here to talk about how the BIMSTEC evolved over the past two decades since its inception in 1997. There are seven member states in the BIMSTEC; five from South Asia namely Bangladesh, Bhutan, India, Nepal, and Sri Lanka; and two from Southeast Asia namely Myanmar and Thailand. Thailand and India took the lead in establishing the BIMSTEC with their own strategic, geopolitical, and economic necessities in the Bay of Bengal region. At that time, India thought that it would be able to build up political and economic ties with the ASEAN countries as part of its Look East Policy, now rechristened ‘Act East’ policy. While Thailand believed that BIMSTEC could help achieve goals of the country’s Look West Policy. Later on, Bangladesh, Myanmar, Sri Lanka, Nepal, and Bhutan were inducted into the regional bloc. Twenty-one years have already passed since the founding of the BIMSTEC through the Bangkok Declaration; the BIMSTEC achieved nothing. The first ever BIMSTEC summit was in Bangkok in 2004, second and third summits took place in India in 2008 and in Myanmar in 2014, and now the fourth summit is going to be organized in the Nepalese Capital later this week. BIMSTEC became visible only when India invited the leaders from BIMSTEC countries to attend the BIMSTEC outreach summit in Goa in October 2016 on the margins of the BRICS summit. The Modi administration abruptly took the policy of excluding Pakistan in South Asia, by shifting the focal point of regional cooperation in South Asia, from SAARC to BIMSTEC. India’s policy shift looked a bit phenomenal at that time because India had never given such prominence to the little-known BIMSTEC by the time. In fact, it was India’s policy shift in terms of its engagement with the BIMSTEC. India refused to take part in the 19th summit of the South Asian Association for Regional Cooperation (SAARC) hosted by Pakistan in November 2016, putting blame on Pakistan for harboring cross-border terrorism. Amid escalating border tensions between the two South Asian nations, as a chair of the SAARC, Nepal decided to postpone the 19th SAARC summit. Given its long-standing animosity and rivalry with Pakistan, India has made series of efforts to isolate Pakistan in South Asia. Hence, it can be concluded that the decades-long enmity, suspicions and trust deficit between India and Pakistan have made the SAARC defunct. Various initiatives taken for deeper regional cooperation on trade, commerce, connectivity, transport, tourism, and transit have made no headway. 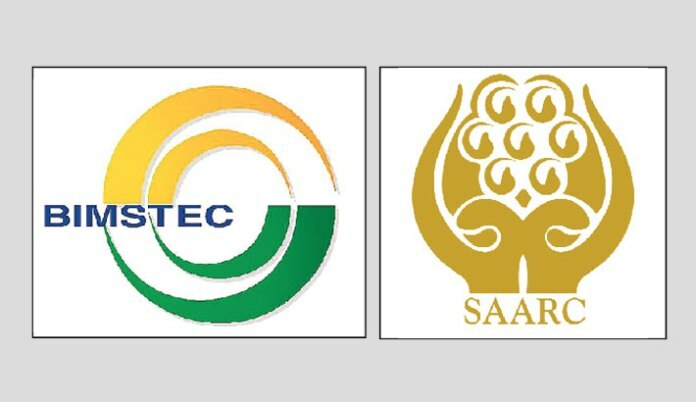 Thus, SAARC functioned more or less like a talking shop in the past three decades since its inception. So far, Nepal and Pakistan are committed to revitalizing the SAARC. But India’s active participation will be vital to reviving the SAARC. Last week, Foreign Minister Pradeep Gyawali, told Kathmandu-based media that the BIMSTEC is not a substitute to SAARC. He opined that as a common platform SAARC can play a pivotal role in advancing prosperity in the South Asia region. With India’s changing behavior and attitude towards the SAARC in recent years, the SAARC has gone almost into a coma. A fresh debate has arisen whether BIMTEC can substitute the SAARC or not. India is going to become a key player in the BIMSTEC. In fact, India is eager to take the lead of the five member states from South Asia namely Nepal, Bhutan, Bangladesh, Sri Lanka in the BIMSTEC. Delhi feels that they are under its sphere of influence. Thus, India will try its best to align these countries with its own regional agenda in the BIMSTEC in coming days. After all, BIMSTEC is likely to be transformed as India-dominated bloc though Thailand is another key player on it. In the upcoming summit, New Delhi is likely to call for recognizing the Bay of Bengal as a ‘common security space’ and nudge member nations to find out means for developing ‘common responses’ to growing security challenges. To achieve this goal, India is going to host the first ever BIMSTEC joint military exercise in Pune from September 10-16, barely 10 days after the Kathmandu Summit. The Hindu newspaper of India reported last month quoting the Indian government sources that the aim of the joint military drill is to promote strategic alignment among the member-states and to share best practices in the area of counter-terrorism. During the fourth summit of the BIMSTEC, the member states will find ways to deal with the menace of terrorism and transnational crimes etc. According to Nepali officials privy to the development, India is trying to use the fourth BIMSTEC summit in Kathmandu to push for early ratification of the ‘Convention on Cooperation in Combating International Terrorism, Trans-National Organized Crime and Illicit Drug Trafficking’, and early implementation of the ‘Convention on Mutual Legal Assistance in Criminal Matters’. India is likely to call for early commencement of negotiations on the ‘BIMSTEC Convention on Extradition’, according to officials. In the upcoming summit, the member states will be dwelling on ways to develop BIMSTEC as a bridging forum between South Asia and South East Asia in sectors like energy, railroad connectivity, and tourism. Out of the seven countries in the BIMSTEC, five including India are also members of the SAARC, while Myanmar and Thailand are with the south-east Asian grouping called ASEAN. Indian policymakers believe that BIMSTEC can become a viable alternative to SAARC. But what other countries except India would gain by isolating Pakistan in South Asia, and making the SAARC forum defunct? Of course, nothing. Thus, BIMSTEC should not be an alternative to SAARC, instead, both the organization can complement each other. Hence, nobody should feel isolated in this region. Moreover, there could be also a prospect of China’s engagement with the BIMSTEC in some way since China has maintained good ties with South Asian and South East Asian countries. In the upcoming summit, the BIMSTEC member states can also explore about involving China in the BIMSTEC. Like in SAARC, China can join BIMSTEC as an observer. Ghimire is a journalist based in Kathmandu. He often writes on foreign affairs.